Medicare and other payors are demanding that post-acute providers such as Skilled Nursing Facilities, Home Health Agencies and Outpatient facilities be more accountable in making sure that patients are not readmitted to the hospital. At Eden Valley Care Center for the past 3 years we have been taking a very proactive approach to integrated care by following certain patients through all levels of post-acute care. When ready for discharge, patients at Eden Valley are given the option of being followed at home by one of the therapists that work at Eden Valley. The numerous advantages to this are the fact that there is already a relationship formed, knowledge of where the patient’s progress isin therapy and east communication among therapist. For patients who live in South County, the final phase of rehabilitation is to return to the Eden Valley outpatient center to help achieve their long-term goals. Often times, this is provided by the same therapist that saw them at home. “The program has been an enormous success” says Rob Snyder, PT, Executive Director of rehabilitation program at Eden Valley. “Both from a patient satisfaction perspective, as well as an outcome perspective it is thought to beat as far as continuum of care is concerned,” Mr. Snyder continues. The rehabilitation program at Eden Valley has continued to grow with not only South County patients but in all areas of the county. Just recently, a patient from Prunedale came to Eden Valley for inpatient rehabilitation and was followed at home by Mr. Snyder only to return all the way to Soledad for outpatient therapy with Mr. Snyder. 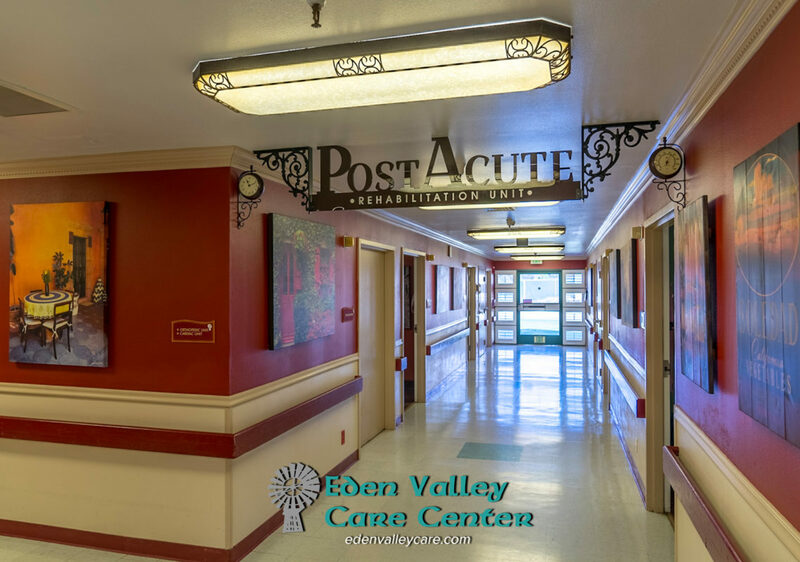 Currently, Eden Valley Care Center is the only Skilled Nursing Facility in Monterey County providing all three levels of post-acute services.